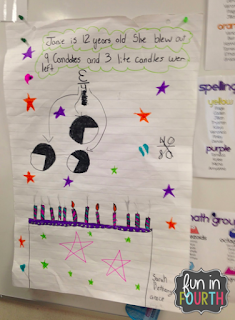 At Janie's birthday party, Janie blew out 3/4 of her candles on her cake, draw a picture that shows the birthday cake, and candles, also showing which candles were blown out. P.S. How old is Janie? Explain your reasoning. This question is not mine - it comes from a Marilyn Burns book. Marilyn Burns is one math rockstar, let me tell you. Anything she writes is genius. To complete this task, I broke my class into groups. 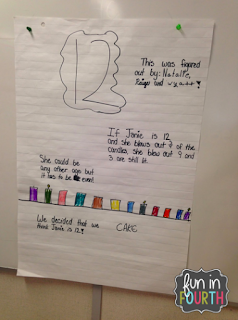 Each group was given a chart paper to show their thinking on. Instantly, every group said that Janie was four. It makes sense, 3/4... blows out 3 of a total of 4. There's your basic answer #1. 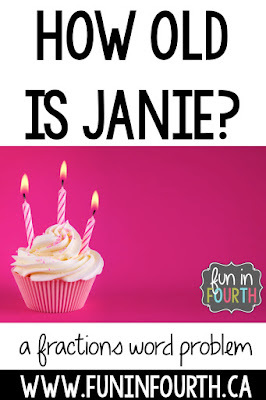 So, I told everyone that Janie could be 4, but they must all find a different age Janie could be. At this point, they were all really mad at me. I mean, seriously, really mad. They had found an answer they liked, and not too many wanted to find another. Perseverance - math trait #1 folks. Needless to say, we needed a second day with this task. I am a huge believer that processing time works wonders. With a night to sleep on the problem, they were all ready to go on day 2. After about 30 minutes, they were ready to present their thinking to the class. #1 - Janie is 100 years old. I really liked this one because of the strategy used here. These kids grabbed a 100 dot array to show their thinking on. When they picked up the array, they really weren't sure what they wanted to do. However, the array is divided into 4 spaces which sparked their thinking. They knew that each quadrant contained 25 dots. Three out of four quadrants is 75 dots. Therefore, Janie is 100 and blew out 75 candles. #2 - Janie is 12 years old (or anything even). These ladies are very neat in their work. They asked to do a second copy to present to the class. I kind of wish I had taken a picture of the rough copy, because of course, that's where the majority of the thinking is represented. 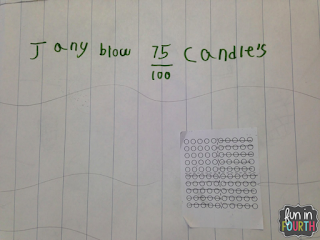 These girls knew that fractions could be part of a set, so they drew out a random number of candles (I think they started with 10) and did a guess and test until they found a set where 3/4 worked. That's how they settled on 12. They also discovered that Janie has to be an even age, which isn't quite true (to be explained later on in the post), but was a good beginning! #3 - Janie is 12 again. In this group, they decided Janie was 12 as well, but came across that answer in a totally different way. They decided to draw a fraction circle to represent 3/4. They too knew that fractions could be part of a set. They decided to draw 3 fraction circles with 3/4 shaded in because the numerator was 3. They then counted up the pieces and saw that Janie could be 12 and blow out 9 candles. #4 - Janie's age has to be a multiple of 4. I was so THRILLED that a group came to this realization. 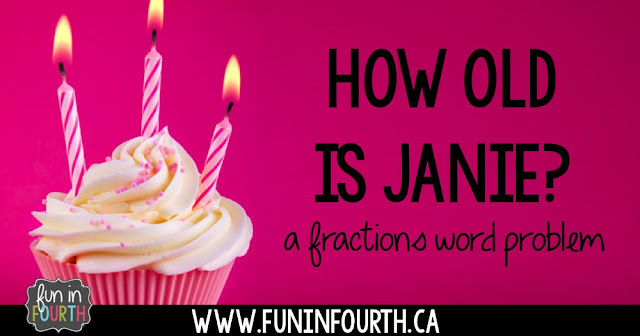 They noticed that Janie could be 12, 16, 20, 24 or anything as long as you are counting by 4's. This was the outcome I wanted, but of course, I couldn't tell it to them! This led to a wonderful discussion that tied in so many elements: patterning, multiplication, the thinking of classmates... it was excellent. I love math experiences like these and hope that the positive energy rubs off as much on the students as it does on me! 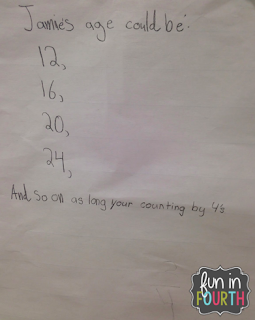 I'd love to hear about any word problems you've presented to your class.